Making A MW AM Radio Like Those You Buy. I did this some years ago in 1998/99. It won't win any RF design awards, it just functions adequately. If you want to build a simpler radio without soldering that is still pretty good, I recommend the Useful Components Choccy Block Radio Kit. Ever been bored over Christmas? 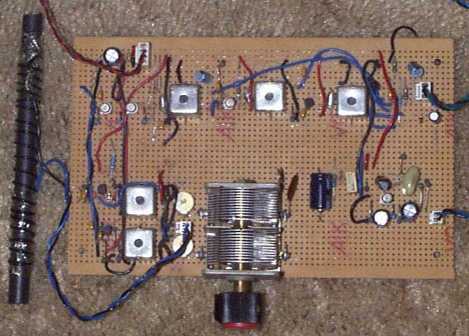 Ever fancied making a proper superheterodyne AM MW radio like those you can buy? No? Oh well, if you did, here's what you might end up with. A MW AM radio like those you buy, or used to buy. Use just BC549 trannies, with the BC559 complement being allowed in the audio output stage. Buying RF antenna coils, oscillator coils and intermediate frequency transformers would be cheating - wind your own. OK, so this is a poor oscillator and could be replaced with something much better out of a 1960s radio. However, it's very simple to understand. The transistor Q4 is biased up as a class A amplifier with some gain. The collector circuit provides feedback to the base via the tuned circuit. The two diodes D1 and D2 make a limiter to stabilise the amplitude across the frequency range. going to individual loads to +BAT. The normal difference voltage output that you'd expect is therefore cancelled and you are left with the much smaller signal which is the effect of more current flowing in one transistor reducing the current flowing in the other, thus reducing its partner's gain and vice-versa. This is straight out of a Robert Penfold radio book. The mixer output goes off to the intermediate frequency stages, and you can see that the mixer collectors go to +BAT through the primary of the first IFT. The output goes to a tap on the primary to avoid loading the resonant circuit too much. This preserves the Q and helps to keep the IF bandwidth narrow. 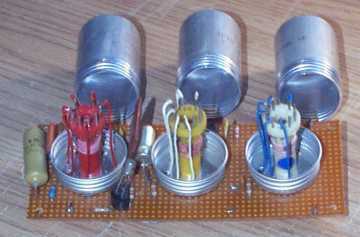 The turns ratios for these home wound Intermediate Frequency Transformers, T1, T2, and T3, were determined by looking up the turns ratios used in TOKO brand transformers for the 1st 2nd and 3rd IFTs. The number of turns for the primaries were first determined by calculating the desired inductance to resonate with the parallel capacitor at the IF of 455kHz. fo=1/2pi*sqrtLC where C is about 220pF typically. Then using the tables supplied with the coil formers and cores the approximate number of turns can be found using the "Al" values. This value gives you a nominal inductance per 1000 turns, and the inductance is proportional to the square of the number of turns. So if the quoted Al for a certain former and core is Al=10uH/1000Turns, and if you wanted 5uH you would wind (5^2/10^2)*1000=250 turns. The Al values work pretty well and I didn't need to rewind after testing, though I may have changed the parallel capacitor value for T1. An RF signal generator was used to check the resonant frequency and to set the cores in about the right positions prior to wiring up. An interesting fact reveals itself in the IF strip. The transistors do not need to be class A biased as you would normally do in a cascaded audio amplifier chain. Because the inductance of the IFTs stores energy, and we are dealing with an AM signal, you can bias the transistors pretty much in class C, only increasing the bias current when maximum gain is needed on weak signals. The signal at the collectors swings above and below +BAT thus also effectively doubling the possible signal swing range. This isn't so important for a 9V radio like this one, but there are very good MW radios out there with 3V and even 1.5V batteries where this must be an important design feature. The schematic shows the emitter resistors bypassed with a capacitor to maximise gain at radio frequency, while the 220R stabilises the bias current when it is flowing significantly under low signal conditions. The bias voltage itself comes from the network comprising the demodulating diode D3, the volume control R16, and R27 and R29. R28 and C15 remove the audio from the d.c. part of the demodulated signal. The network is arranged such that when there is no signal present the full bias voltage is applied to the IF transistors and you get about 2mA quiescent current and a fair gain. When a strong AM signal comes along it is rectified and the audio tapped off. But the rectified audio is also creates a negative bias which reduces the voltage on the electrolytic cap. The reduced bias voltage puts less bias current through the IF trannies and the gain is reduced. 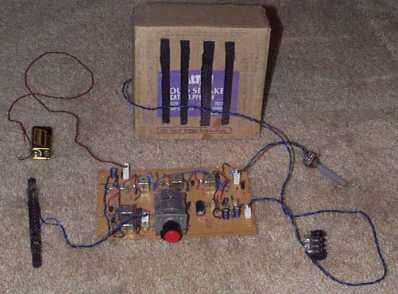 This primitive AGC action is similar to that used in the very old Roberts radios. IF strips like this are really quite non-linear depending mostly on the quality of your IFT windings. If you put in a perfectly sine modulated carrier then the shape of the AM signal at each IF stage depends on the bias current and the position of the core in the winding. Maximum linearity rarely happens at maximum resonance, which is where you tune it to in a primitive radio like this. I guess that the linearity can probably be improved by using nicely wound Litz style windings in the IFTs rather than just piling the turns on like I did. But, you won't hear anyone tell you that in a radio book and for certain you won't learn it on a university degree course. Despite the distortion added in the IF strip, depending on where the tuning slugs are and on the bias current set by AGC, this wireless sounds like any average AM radio. To see how to make really nicely wound double tuned IFTs, take apart an old Hacker radio. I always considered radio books which used ready made coils to be major cheats. Further to that, the Babani radio books always used to use Denco/Clacton/Maxi-Q coils who went out of business somewhere round the mid-(nineteen)eighties. Many amateurs will remember these coils I'm sure, being supplied in old fashioned 35mm aluminium film canisters which you were supposed to use for the screening can by drilling holes in the screw-on lid to accomodate a 9-pin valveholder, and a small hole in the main canister through which you could poke your screwdriver to tweak the brass screw. This would in turn move the ferrite core up and down. 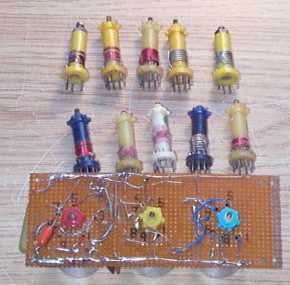 I still have a pile of these coils bought from a sale and three which I bought new at immense expense as a poverty stricken child to try to make an 80m band SSB SW radio receiver. It didn't work, but a direct conversion one that I made with a Denco coil did and this introduced me to my first experience of the frequency shifting effect of tuning through an SSB signal. I still have the non-functional circuit, and here is a picture of the damn thing. The direct conversion receiver mentioned ended up in junk box heaven, there to be slowly crushed by the pressure of continuing deposition. The red coil is supposed to be a self oscillating mixer using a 2N3819 JFET. This thing would not oscillate, no matter how many wet fingers were poked around it. The coils are relatively enormous by modern standards, being made to go in valve equipment originally. They were made so that as a hobbyist, you could unplug the RF coil(s) and plug in another one to switch bands if you didn't want to use a wavechange switch. Their main advantage, as I see, it is that they are very pretty colours. No-one in the UK makes such coils or coil formers and cores any more. Toko make coils but it's generally very difficult to get small quantities, though Maplin stocked them for a while. Maplin are too busy stocking cheap Christmas lights nowadays to bother with such items. However a company called Amidon in the States do exactly this sort of thing. Ordering them on a credit card over the phone is easy, though you occasionally get chargedimport duty. The pitch of the connector pins is not 0.1inch and the screening can legs are too fat for veroboard, so a bit of board mangling and soldering to the cans is called for. If I was being particularly brave I would've tried doing something like winding all the coils on chopped up bits of biro, but the Amidon formers and cores seemed like a sufficient challenge. This is very standard, using a simple voltage amplifier stage Q10 driving a class B output stage Q6 and Q11. The biasing is a bit fancy. It uses the transistor Q7 and the 1K adjustment trim. This effectively makes an adjustable voltage which is a multiple of the Vbe of Q7. Q7 is epoxied to the output stage transistors for thermal coupling. The output stage transistors are a bit weak to drive an 8 Ohm speaker very loudly but they manage a voltage swing of a few volts nonetheless. R20 should be adjusted so that about 5mA quiescent current flows in the output stage with no audio. 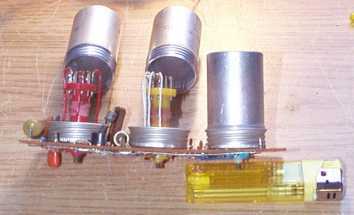 The 100uF decoupling capacitor shown on the battery input is best located physically right across the collectors of Q6 and Q11 otherwise the audio stage can go unstable. Here is a site discussing Superheterodyne Radio Component Value Calculations for Correct Tracking. In practice you tune to a fixed frequency signal near the top end of the band and tweak the oscillator trimmer to get the desired top-end coverage and the antenna capacitor trimmer for best signal. Then you tune to a signal near the bottom end of the frequency range and tune the oscillator inductor for correct bottom end coverage and then the antenna inductor for best signal. If the fixed component values are about right to start with, this process should iterate to convergence on a fair compromise with at least good tracking at either end of the band. Aldershot Garrison Radio News In Jingle. I'm about three miles from Middle Hill in Aldershot where AGR broadcasts on a standard 1Watt ERP restricted service AM license on 1287AM. It's a fairly weak signal and you can hear the noise, which is mostly from the radio circuitry rather than atmospherics. I can't resist sharing their cheesey voice-over jingles. Some day, in the far, far distant future people will realise that doing voice-overs in a hilarious Smashey and Nicey voice is not actually such a good idea unless you want to make your station sound comic. 1) Make a proper oscillator, a Colpitts or something that doesn't need the diode limiter to keep the output constant over the fairly narrow tuning range. The limiter adds distortion, and we want to keep the signal pure to avoid unpleasant image responses. If the oscillator is distorted you get a radio full of whistles and breakthrough of strong SW stations. I avoid that here, mainly by using the buffer after the oscillator to reduce frequency dependant loading effects. 2) Use cheap RF silicon transistors for the RF stages rather than pressing BC549 audio transistors into service. I used audio transistors mainly for convenience and because I have always disliked projects that use many different, and often expensive devices unnecessarily. BC549s have a pretty good high frequency capability in fact, so I knew I could get away with it. 3) Improve the linearity of the IF strip with cunning neat coil winding. This is probably difficult to do without some kind of coil winder.